This post was inspired by how complicated it can be to modify a standard sign. 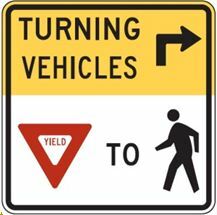 The specific sign is shown below and is the Right Turn Yield to Pedestrians Sign. There was significant debate on a seemingly simple topic of adding a bicycle symbol to a sign that previously had a walking person as the only option. There were 40 comments from across the country that included some fairly concerning perspectives that border on unprofessional. One comment that I am willing to talk about includes that by adding a bicycle symbol to the sign, "there is an impact to pedestrian travel". In other words, the simple placement of a bicycle on the sign would somehow degrade the pedestrian environment. The specific comment was: "The R10-15 sign should only be used at intersections where there are no marked crosswalks, because the sign gives the pedestrians short shrift." Clearly the comment was made in a manner that highlights bias from the commenter. I think this reflects the challenge of people working to improve the bicycling and pedestrian environment. Another thing that the commenters seem to forget is that the sign is optional. Clearly, if their engineering judgment suggests that the sign is not the right one for their conditions, they don't have to use it. In Portland, we have found them helpful and will continue to use them selectively to address locations where travelers may benefit from a reminder of the expectation. There was also a comment related to "how will people on bicycle know how to use these signs". Luckily on the Committee, the point was made that the sign is not for the people on bicycles, but rather for oncoming vehicles that could use the information explicitly. Can you provide a link to where the full comments are published?